You are here: Home / Teaching Preschool / The Teaching Aide Every Piano teacher needs! Hi, and thanks for checking out my blog! I’m so excited to share this new device that we have been using in my piano studio!!!!!!!!!! It’s the “Pink Blob” as we have named it! Do you have lots of students who are driving you NUTS with their constant wiggling and fidgeting no matter how many times you ask them to stop? Keeping a child’s attention on their piano lesson can be difficult for the most seasoned piano teacher. Doing so when that child has autism, ADHD or some other learning disability can be even more challenging. Many of these children have less muscle tone or a constant need for movement-based sensory input that contributes to fidgeting, slouching or soreness, making it tough for them to engage in learning. Did you know that movement, when harnessed correctly can ENHANCE learning?! 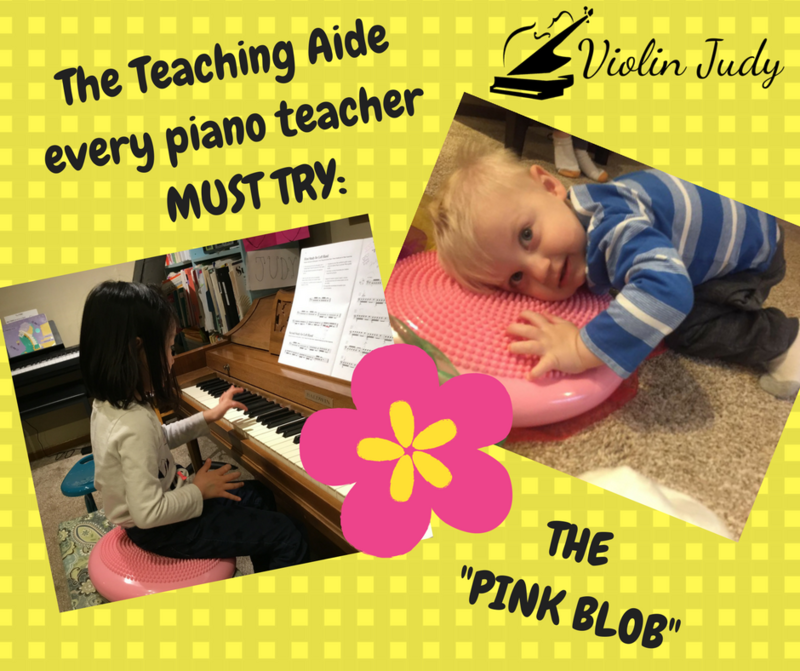 When your piano students don’t have to sit perfectly still and feel confined, they feel in control…and kids love to have options! “Sit still!” Most of us can probably remember being scolded in our lessons like that a few times. More and more, however, teachers and therapists are finding that may not be the best instructions for their students. Active sitting is based on the idea that it’s not healthy for the body to be seated for long periods of time. Too much sitting still has been shown to lead to back and hip soreness, fatigue, decreased muscle tone and lack of ability to focus. Active seating corrects these problems by promoting slight movements and adjustments for the user while they sit. These movements keep the body more engaged, alleviating the negative effects of prolonged sitting. First, Improved posture and muscle tone – Your student’s frequent wiggles while on a wobble cushion strengthen the core abdominal and trunk muscles. This is important because increasing strength and muscle tone will also promote motor control in those piano fingers! Secondly, Sensory input and energy burning – Some of your piano students really need to just keep moving! Their muscles crave activity, making it hard for them to sit still for long periods of time or focus on the lesson at hand. Because active seating lets kids move and adjust themselves in a non-disruptive way, they burn off excess energy and get the stimulus their muscles are looking for, making them more attentive during lessons. Lastly, Increased blood flow – As a child moves during active sitting, the heart pumps a bit faster and blood vessels in the legs and hips open up which increases blood flow. Better blood flow means more oxygen moving to the brain. With more oxygen, brain function increases, allowing for improved focus and better knowledge retention! I started out with one wobble seat and now I have purchased enough wobble seats for my group piano class, and without breaking the bank. I tested the wobble seat last month with every single student. 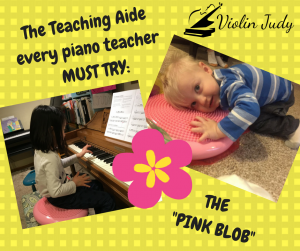 Over 80 percent of my private lesson piano students-ages 3 through Adult absolutely LOVE this seat and ask to use “the pink blob” as we are calling them, in their lesson. I am sitting on one as I type this blog post as well! 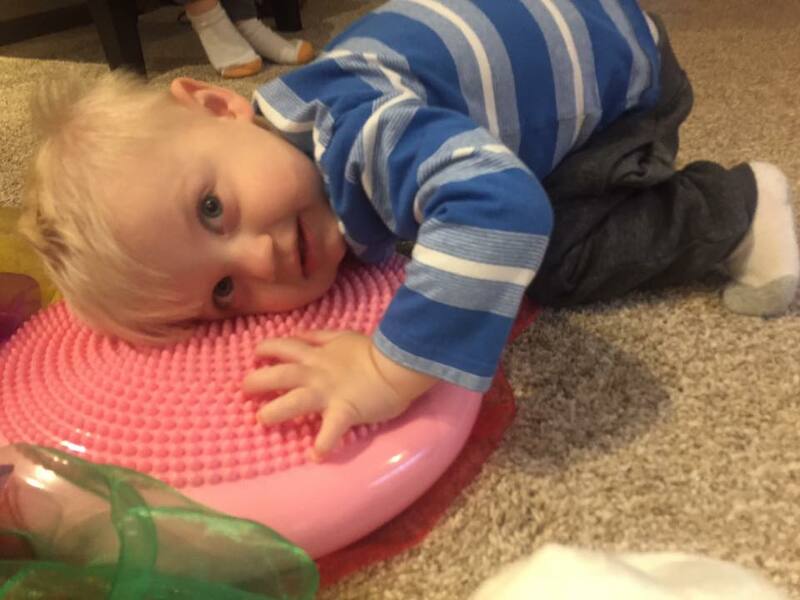 In addition, during my Little Music Classes, the babies and toddlers love sitting on them during our circle time~I love a product that can multitask! Each wobble seat comes slightly inflated and you may want to leave them this way if you teach mostly young beginners. My wobble seats are inflated in varying degrees and really are fun looking as well! When i first took it out of the package, I was highly doubtful that I had made a purchase that would be useful in my studio, so I encourage you to try it with you students. My personal experience is really positive. 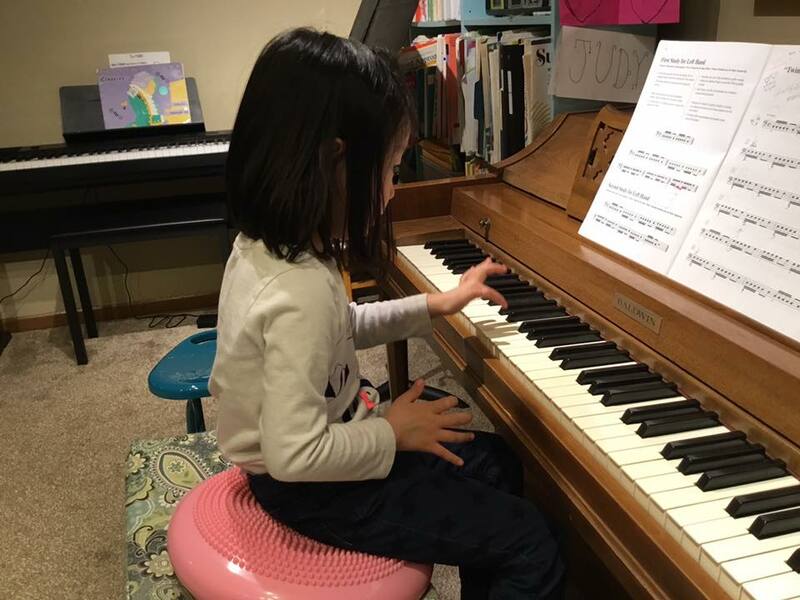 My youngest piano students are sitting higher on the bench which helps their hand posture, their wiggles are greatly decreased, and they are having fun without realizing that they are paying attention and being really focused for longer periods of time! I hope you try this device out in your studio and that it helps your students too! Be sure to come back and give some comments of how this works with your students! Wondering if you could use something like this for students who can’t keep their feet grounded on the footstool? Yes, I have actually used not the spiky side, but the other just bumpy side for feet. Now I have used the spiky side and my students are loving it!